You'll love these cute little single serving size snacks! They make portion control a no-brainer. Cheesy, crunchy, and shaped like little fishies, Goldfish Snack Crackers are great. Unfortunately, they're also super-addictive. 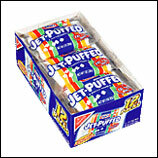 Once you start munching on 'em, it's hard to quit. Which can be dangerous since there are plenty of fish in the, um, bag. That's why we are so in love with these individually sized pouches of Goldfish. Each bag contains a reasonable 140 calories and 6g of fat worth of crackers, making these snacks quite the catch. Cereal is one of the toughest foods to portion out. C'mon, how many of us actually break out the measuring cup when we make ourselves a bowl of the stuff? Which is exactly why we're such big fans of individual serving size boxes and bowls of cereal. You can find them in tons of varieties--from Special K to Frosted Flakes and Rice Krispies. And, because these 70 - 120 calorie babies are easy to carry, you can take 'em to work and have a quick breakfast there, or keep some in your car as a dry snack option. Weeeee! Cheese is one of those foods that can be really good for you, if you eat it in tiny amounts. 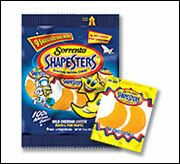 Shapesters makes sticking to that 1 oz. serving size easy. Their familiar-looking big bag of cheese is different in that it contains lots of little baby bags which hold (you guessed it) exactly one serving worth of the stuff. And the best part? Nutritionals vary for the different varieties (about 110 calories per serving), and they come in fun shapes like stars and moons, sharks and fish, and even dinosaurs! Cheesy and cute? A double whammy! It seems that portable soups are popping up all over the place these days. Not that we're complaining. Especially since the latest company to join the microwaveable soup fray is Healthy Choice. HC's perfectly portioned soups come in three varieties--Old Fashioned Chicken Noodle, Chicken with Rice, and Country Vegetable. All of them are great. These healthy soups are low cal, low fat and super convenient. OK, you caught us. These microwavable bowls actually contain TWO one cup servings, but they're so low cal (180 - 220 calories per tub) they're actually a perfect meal for one if you eat the whole thing. You really can't go wrong with Keebler's Right Bites Sandies. These cute little cookies are crisp, buttery and delicious. Even better, perfectly portioned into individual pouches, these shortbread cookies have just 100 calories and 3g of fat. And because they come in single serving sized bags, there's not any temptation to scarf down a huge bag of them at once. Cookie-rific! These adorable little pouches of Jet-Puffed mini marshmallows from Kraft are a must-chew for anyone who loves the fluffy, sweet white treats. With just 90 calories and no fat per bag, they're the ideal snack for marshmallow-lovers who can sometimes get a little out of control around the sweet, fluffy treats. HG Tip: Use 'em as topping on your lowfat ice cream, or stir a few into your low cal hot cocoa. Share these super singles with your pals and family members. Click "send to a friend" NOW!